UNESCO World Heritage Sites in the Czech Republic. "There are garlands of skulls, more than 40,000 skeletons and four Baroque candelabras made out of bones," I told Stéphane before blithely popping a piece of apple strudel in my mouth and taking a sip of cappuccino. 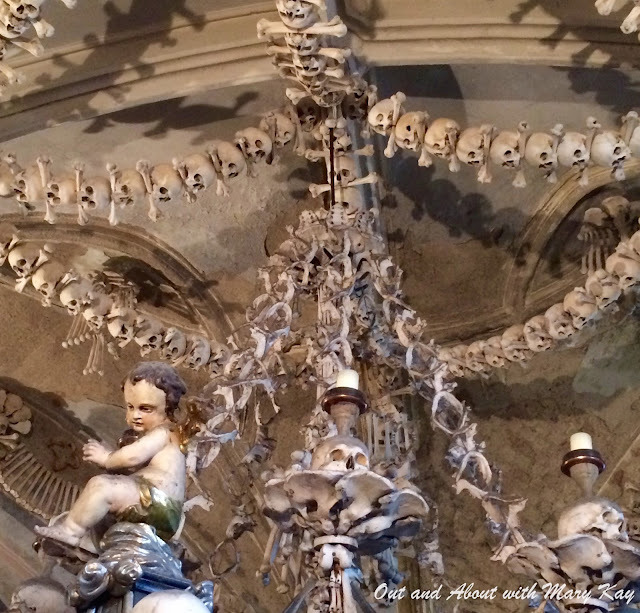 "The Bone Church seems to be everyone's favorite site in Kutná Hora," I added while scanning articles about the Sedlec Ossuary on my iPhone. We were seated at Café Lavande discussing how to best spend the afternoon before heading back to Prague. The problem was that we had underestimated how much time we would need to see everything of interest in the region. Because Stéphane has always wanted to go to the catacombs in Paris, something which we never got around to doing, I thought he would be excited by the prospect of seeing something similar in the Czech Republic. 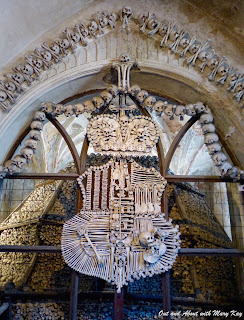 When Stéphane expressed some reluctance, I said that rather than being macabre, the guidebooks explained that the arrangements of bones are supposed to represent eternal light and the equality of everyone in front of God. Instead of being a grotesque reminder of death, the ossuary symbolizes the Christian belief in resurrection. It seemed like the perfect place to visit on Easter Sunday. 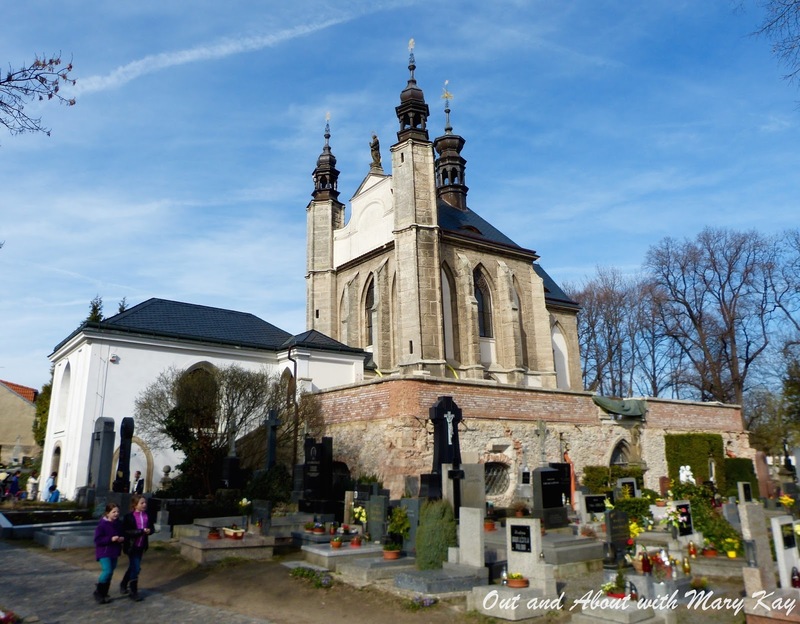 Founded in 1142, Cemetery Church in Kutná Hora was part of the oldest Cistercian monastery in Bohemia. According to legend, the Czech king sent an abbot from the Cistercian monastery to Jerusalem in 1278. The abbot was charged with the task of bringing back some soil from Golgotha, the site where Jesus Christ was crucified, and scattering the sacred soil over Sedlec cemetery. This act, which transformed the cemetery into a "Holy Field", had people from around Europe clambering for the opportunity to be buried there. Similar Holy Fields were located in Rome, Pisa and Paris. When the devastating plague known as Black Death swept through Europe in the 14th century, room had to be made for 30,000 more bodies. 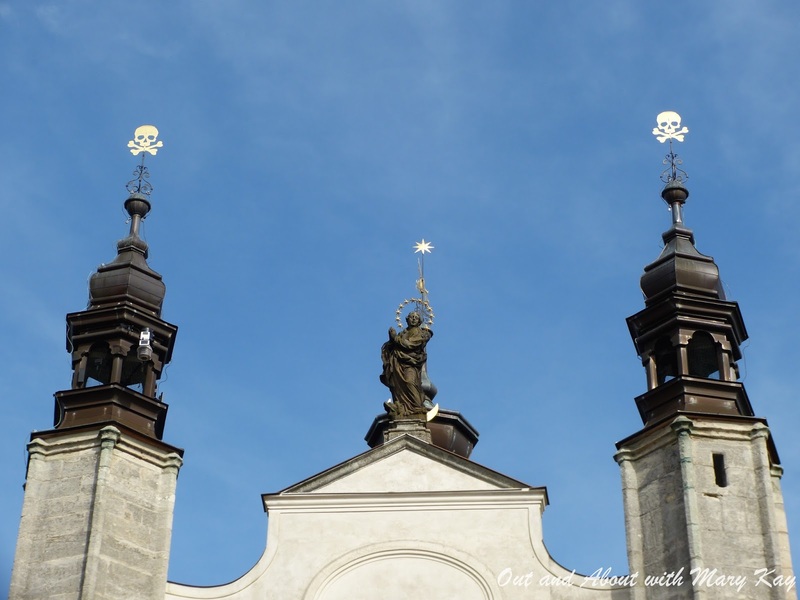 An additional 10,000 people were buried in Sedlec cemetery during the Hussite Wars at the beginning of the 15th century. At the end of the 15th century, the cemetery was partially reduced and the bones from the abolished graves were moved to the ossuary. 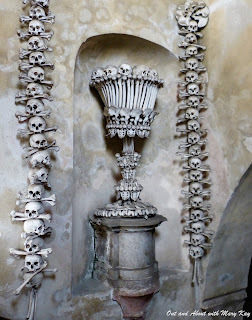 The task of exhuming the skeletons and meticulously stacking the bones in the chapel was given to a half-blind monk. Legend has it that his eyesight was restored upon the completion of his work. The Cistercian monastery was abolished by Joseph II in 1783. The property of the abbey was subsequently purchased by the Schwarzenberg family from Orlík. 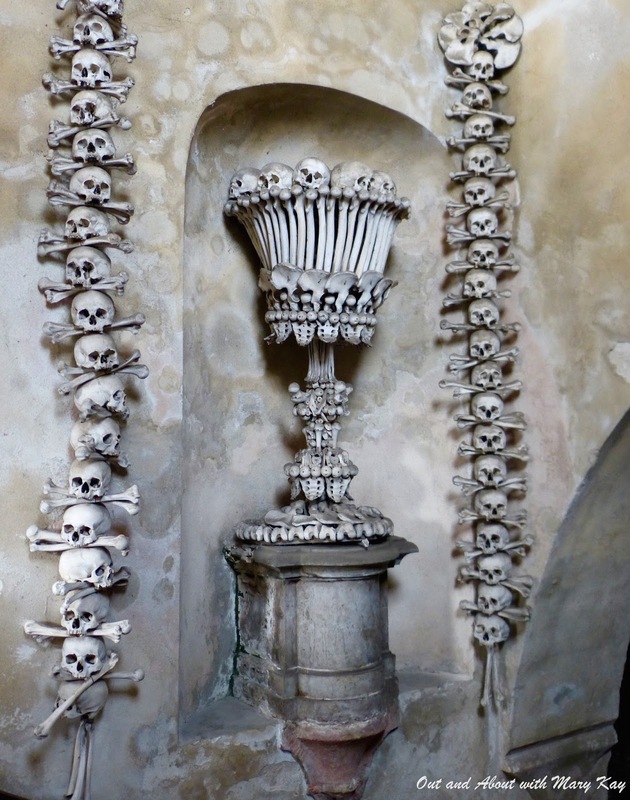 It was thanks to the noble family's patronage that the Sedlec Ossuary was maintained. The Baroque bone decoration was renewed and extended by local wood carver František Rint in 1870. The bones used by Rint were disinfected, bleached with chlorinated lime until they reached the desired color and placed in symbolic patterns. 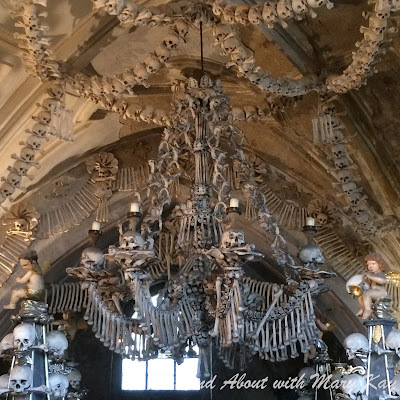 Most remarkable are the skull chandelier that utilizes all the bones of the human body and the Schwarzenberg's coat of arms made from an assortment of bones. 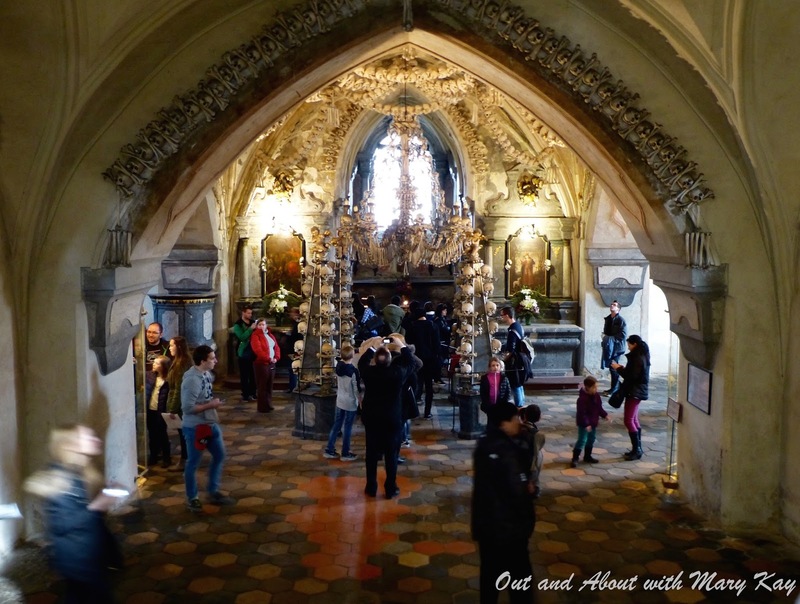 Insider's tip: The Sedlec Ossuary is open every day with the exception of the 24th of December. To avoid the busloads of tourists who visit in the morning, it's best to go in the afternoon. If you plan to spend a couple of days exploring the region around Kutná Hora, Chateau Hostacov is an excellent place to stay. It definitely is a little macabre for me, but I'm sure it's an incredible sight in person. I can imagine! And goodness, now I am really wondering: what did they use? Some form of cement? Fascinating! I didn't know you never made it to the catacombs in Paris. It's still on my list as well. Amy, I think the catacombs may have been closed the first couple of years we were in Paris and then the line was always so long whenever we passed by that we just kept putting off for another day. I hope that you're able to travel to Paris and cross it off your list in the near future! That's a unique place! I've been there a few months ago and it's definitely worth a visit!